US actor George Clooney has accused the Daily Mail of "irresponsibility" after it claimed his fiancee's mother opposes their marriage on religious grounds. The British tabloid, he said, had been "negligent" in "exploit[ing] religious differences where none exist". Earlier this week, the Mail claimed Amal Alamuddin's mother, Baria, wished her daughter to be married within the relatively small Druze sect. The Mail Online has since apologised "for any distress caused". In a piece published by USA Today, Clooney said he was "used to the Daily Mail making up stories" and accepted "freedom of speech can be an inconvenience to [his] private life". Yet the piece in question, he went on, put his family and friends "in harm's way" and took the newspaper "into the arena of inciting violence". Clooney's engagement to Amal Alamuddin, a London-based barrister who specialises in human rights cases, was confirmed by her chambers in April. The Mail's report, published online on Monday and then in print on Tuesday, in an amended form, said "close family friends" had told them that Baria Alamuddin had been "telling half of Beirut" that her daughter "could do better". "There are 500,000 Druze," one of their unnamed sources was quoted as saying. "Are none of them good enough for her?" 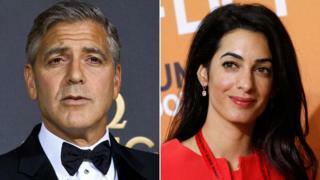 "Amal's mother is not Druze," responded Clooney. "She has not been to Beirut since Amal and I have been dating, and she is in no way against the marriage. "But this lie involves larger issues. The irresponsibility, in this day and age, to exploit religious differences where none exist, is at the very least negligent and more appropriately dangerous." The Druze are a religious sect whose beliefs are based on Islam but also incorporate elements of other religions. There are an estimated 700,000 members, mostly in Lebanon, Syria, Israel and Jordan.